Explore, Learn, Have Fun! : Parched? 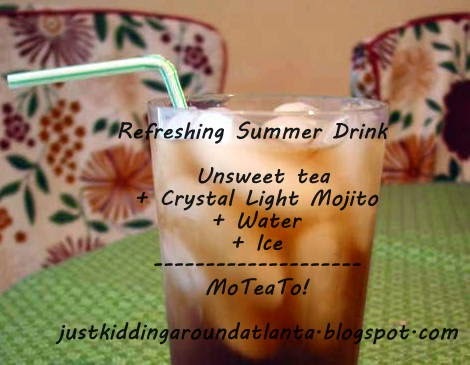 Try a Mo-tea-to for a refreshing drink! Parched? Try a Mo-tea-to for a refreshing drink! I swore off regular soda almost 5 years ago, and kicked my diet soda habit when I did my 12 day juice fast back in March. So it's been tough finding a new drink I like. Mostly I've ordered half cut tea (1/2 sweet tea, 1/2 unsweetened tea). I love it. We also like Arnold Palmers - 1/2 unsweetened tea, 1/2 lemonade. Update, as of 7/27/14 - I no longer drink half cut tea or Arnold Palmers. This drink is still wonderfully refreshing and is an occasional treat. I like to make it in our Vitamix with extra ice for a slushy drink. Delish! What's your go-to drink in the summer? Mmm! We drink a ton of lemonade at our house.